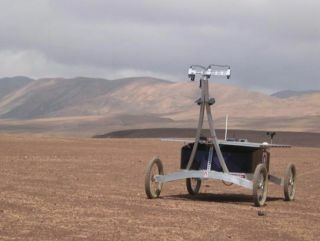 The four-wheeled, solar-powered Zoë rover completed a two-week traverse of Chile's Atacama Desert on June 29, 2013. A rover named Zoë recently traveled the Atacama Desert in Chile, the driest place on Earth and a landscape that has much in common with the harsh terrain of Mars. From the unrelenting ultraviolet (UV) radiation to the thin, cold air at high altitudes to the desiccated sand and lava flows, the Atacama is not especially "life-friendly," but it is a great place to test instruments for future Mars missions. This recent excursion with Zoë ended on June 29, and it is part of a longer three-year campaign, led by David Wettergreen of Carnegie Mellon University, to test the rover’s instruments and drilling capability. The project is supported through NASA’s ASTEP program to advance the technology and techniques used in planetary exploration. Thanks to Zoë’s onboard autonomy software, the science team in the United States was able to explore the Atacama remotely, just as NASA mission control would operate a rover on Mars. The engineering team was in the field with the four-wheeled, solar-powered rover, on hand just in case anything went wrong. Also, "we had a couple people collecting ground truth," Wettergreen said, "digging pits to make sure what the rover was sampling autonomously was the same as what we’d get on our own." The Zoë rover being checked out at the start of its Atacama Desert traverse in June 2013. In the background are the two 4x4 trucks that were used to follow the robot. The engineers stay within communication range to monitor the robot but try to say out of view as much as possible. After Zoë’s 3.3-foot-long (1 meter) drill dug up samples, the rover deposited them into sample cups and analyzed them with instruments such as a laser Raman spectrometer (the MMRS or Mars Microbeam Raman Spectrometer). The MMRS shines a laser on the sample and measures the energy of the photons scattered back, providing a clear spectrum of each mineral phase and organic molecule. "The Raman spectrometer instrument was remarkably robust," Wettergreen said. Not only was it exposed to a broad range of temperatures, "which is a lot for a laser and detector to take," he said, "but it got quite a beating over some pretty rocky terrain. Some of the areas we crossed were fairly rugged, so it had to put up with a lot of vibration and shock." The rover also has a Bio-UltraViolet Fluorescent instrument (BUF) composed of light-field cameras that can focus at multiple depths. "The UV causes organics to fluoresce, telling us the abundance of organic materials in the samples," Wettergreen said. Zoe made 11 sample drill holes, with samples taken at different depths, resulting in a total haul of about 40 samples. "Ultimately the science team settled on taking samples from 10 centimeters, then 30 centimeters, and then 80," Wettergreen said. "The depths were determined on where salt layers formed in the soil, which is a function of how far moisture penetrated." Nathalie Cabrol of the SETI (Search for Extraterrestrial Intelligence) Institute, the science principal investigator for the project,sees the field campaign as a big success; the rover was highly mobile, traveling up to 6 miles (10 kilometers) per day, and the drill and other instruments worked as they should to gather samples and analyze them. And importantly, all of this was performed autonomously for the first time. "This is huge," Cabrol said. "We can now provide astrobiology with a highly mobile drill-mounted rover that is able to test for the possibility of life on Mars." She said that by "punching holes down to 80 centimeters, Zoë can get better access of the record of life on Mars than the MER Opportunity or the MSL Curiosity rovers that are now on Mars." The Zoe team collected good quality data, she added, and now scientists need time to analyze it all. One problem that can arise with drilling is contamination of the samples. Wettergreen said this issue was studied intensively in the lab by Honeybee Robotics, the company that made the drill (and also made the much smaller drills for Opportunity and the Curiosity rover). Wettergreen said there are two ways to contaminate a drill hole: by moving material at different depths (either up or down the drill column), or transferring material from one drill site to another. The Honeybee lab tests found that only a small fraction of material moves in the drill column; instead, the force of the drilling process essentially cleans the drill. Although the team did not practice this in the field due to the limitations of time, on Mars, a rover would minimize any contamination between sites by drilling a few "waste" holes just to clean off the drill. After this year’s field campaign, the engineers now have a list of improvements and refinements they need to make on the rover and its instruments. Next year, they plan to take Zoë even farther afield, following an east-west transect across Chile into different elevations and environmental conditions, and hopefully generating even larger science returns. This story was provided by Astrobiology Magazine, a web-based publication sponsored by the NASA astrobiology program. Follow SPACE.com on Twitter, Facebook and Google+. Article on SPACE.com.